Pancakes don’t always have to be sweet. Why not offer something different and go down the savoury route? Add a Peking-style twist to your pancakes and top with sticky, grilled or roast duck breast. Pair with a crisp apple salad and some crunchy peanuts. Fruit and pancakes go hand in hand. But don’t stop at just one. Check out one of our favourite recipes for Mango Tango pancakes here. With lemon curd, pomegranate seeds, strawberries, mint leaves, mango, pistachios and passionfruit any sweet tooth will be over the moon. There isn’t much that grilled cheese toasties aren’t good on. Croissants, white bread, sourdough, bagels… but have you considered pancakes? A perfect, and more fun option, for a kids’ menu. You’ve probably seen crepe layer cakes, but have you considered pancake layer cakes? Our innovative chef Mal Gill made a decadent layer cake using whipped cream, berries, biscuits and lots of Nutella. With a couple of cheeky macarons as a garnish this is a perfect dessert option for diners to share (and Instagram!). Bread and butter pudding has long been a solution for venues with bread that is past its prime. But consider making it with pancakes. They will go super moist and absorb the flavours of any number of ingredients (consider Tia Maria and cinnamon or blueberry and pecan). Next time you’re thinking of adding pancakes to your menu, try something out of the ordinary. 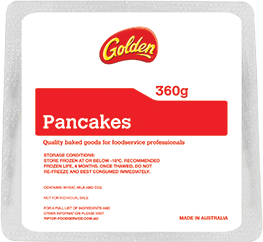 Consider adding Golden Pancakes to your next order – available frozen through distributors nationwide so you don’t have to worry about waste.